When I started to think about writing this blog post I had one of the biggest blogging dilemmas ever. Should I share this beautiful place with the rest of the world or should I keep it for myself as long as I could? 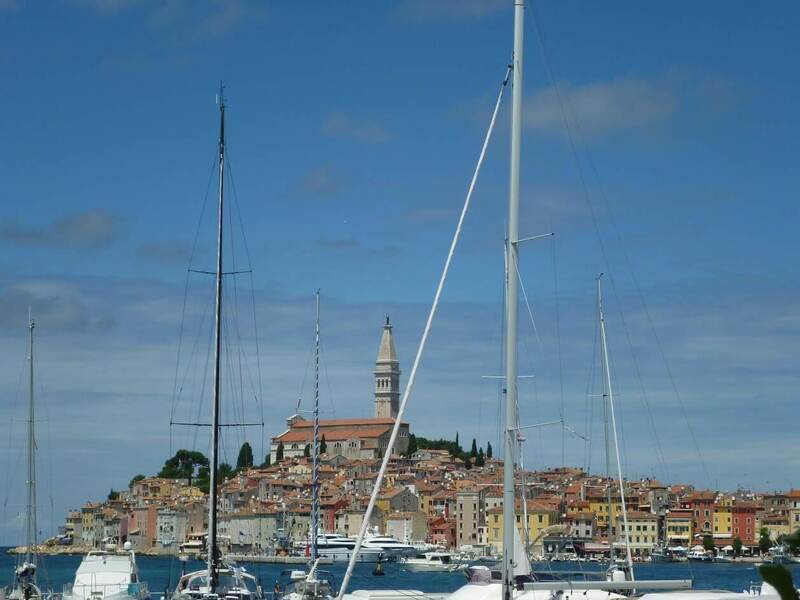 If there would be one word that would mean a ‘vacation’ to me, it would be Rovinj. I just have so many lovely memories from there that it really became another home to me. I spent some of the first summer vacations as an adult there, watched so many beautiful sunsets from its Medieval walls and got engaged there! Rovinj is located on Istrian peninsula, on the very south-western corner of Croatia, very close to the border with Italy. 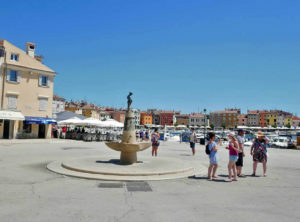 The closest airport is the one in Pula (30 minutes by car from Rovinj). But you can also fly to Zagreb and rent a car (some 2 hours) or take a bus (3 – 4 hours) and drive to Rovinj. Although it is a longer journey I would always choose it because of a very beautiful scenery along the way. 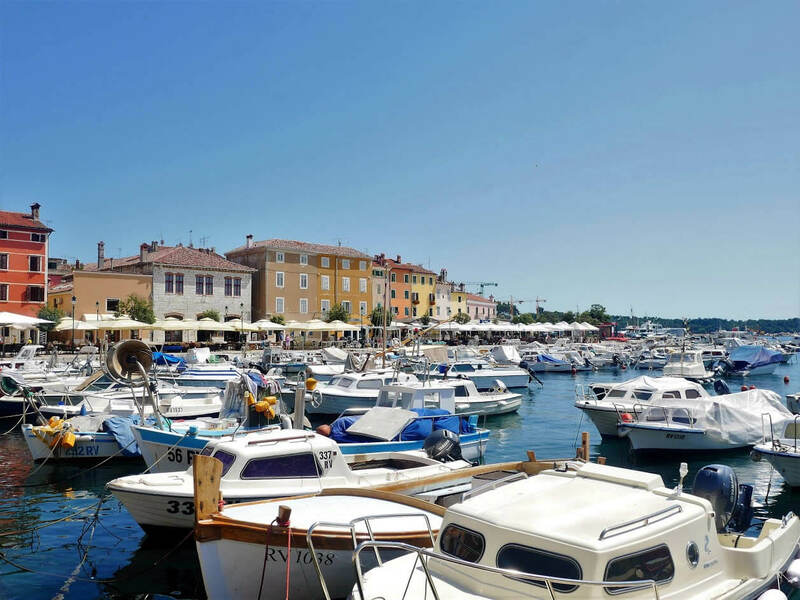 When it comes to a summer vacation, Rovinj really has it all. 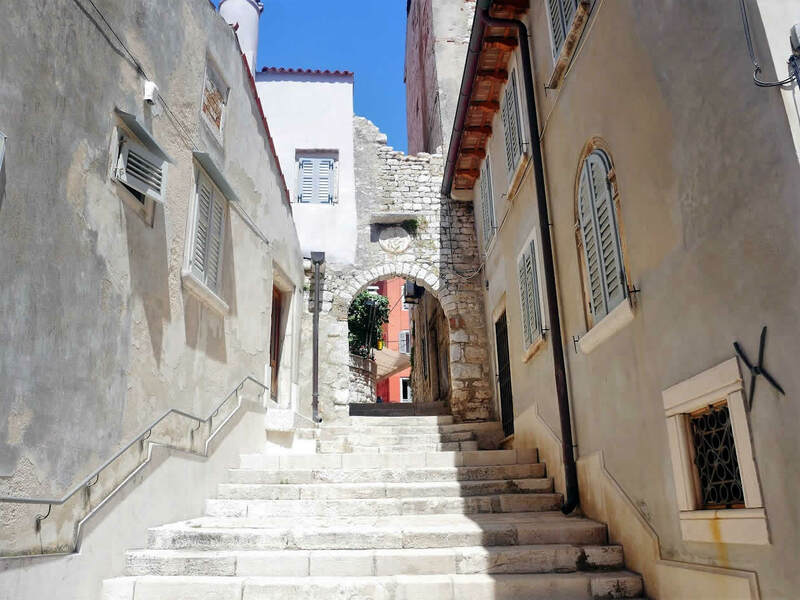 An old town with its many cobbled streets and small galleries, great restaurants and plenty of nice accommodation (from private apartments to a five-star hotels). It also has some very nice shingle beaches with a clear blue sea. And it’s also perfectly located in the central part of Istrian peninsula, so it’s very easy to explore its other towns from there. Rovinj was founded as a small village on a tiny island, surrounded with high walls to protect itself from the pirates and conquerors. Later on they’ve connected the island with the inland. However, you can still feel its shape when you’re looking to Rovinj’s old town from a distance. On a top of an island a large Saint Euphemia Church is located. You’ll recognize it by the statue of a saint that’s turning depending on a wind direction. 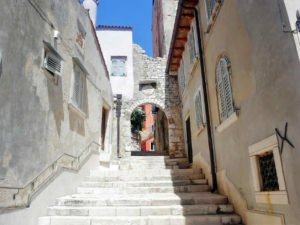 From the church you can take a walk through any of the Old Town’s small streets. You’ll often find very old houses with small statues or some other decoration on them. What I really like is that the city is not abandoned. 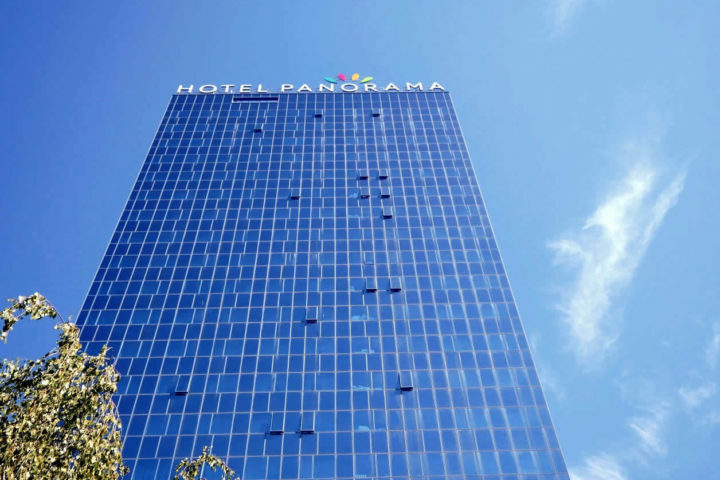 You’ll see clothes drying on windows, cats sleeping at the front doors and people reading on their balconies. The whole town has that ancient feeling where time stands still and nothing really changed since it was first inhabited before the Roman times. 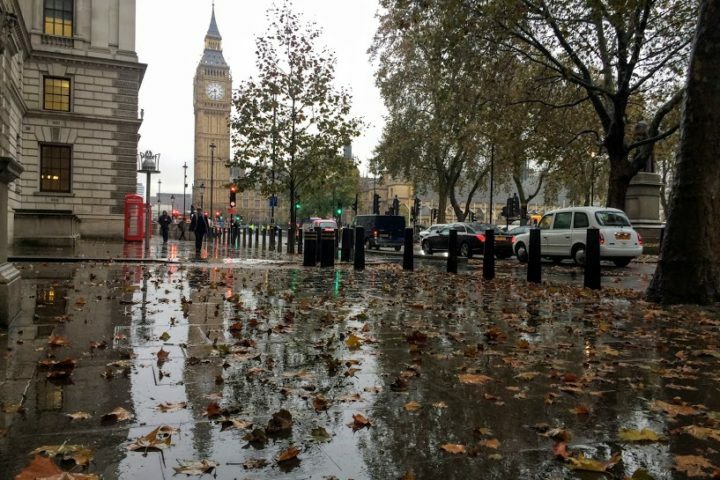 And when you’re walking around it you have a feeling like you just travelled back to some of those passed times. 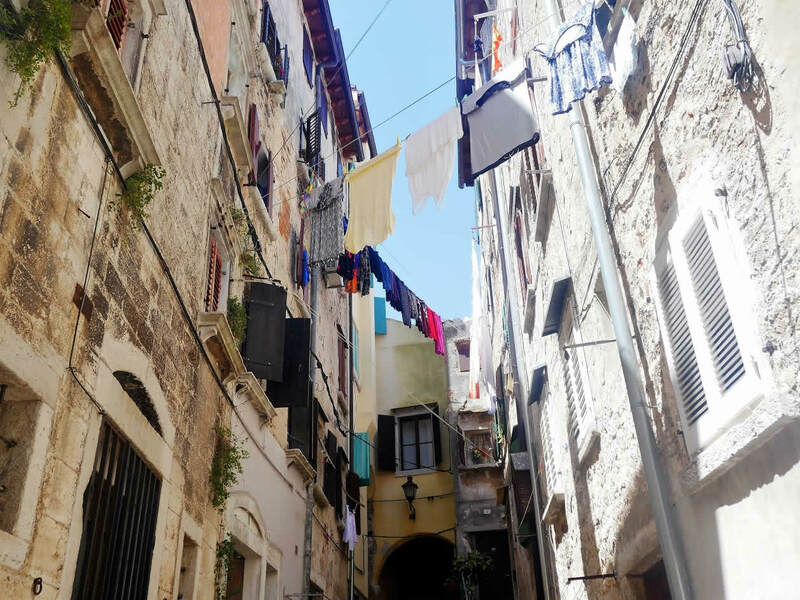 The main street that goes from Saint Euphemia Church towards the entrance of the Old Town is called Grisia and is known as an artistic street. It’s filled with many galleries selling fine art made by mostly Croatian authors. *TIP: Some of the paintings from there could be a great souvenir to take home with you. Once per year (on one of the Sundays in August) the street is becoming an open air museum, where artists (and anyone who’s interested) could take their easels and paint or work on any other forms of art. Being a true art town, Rovinj has some of a very interesting museums too. 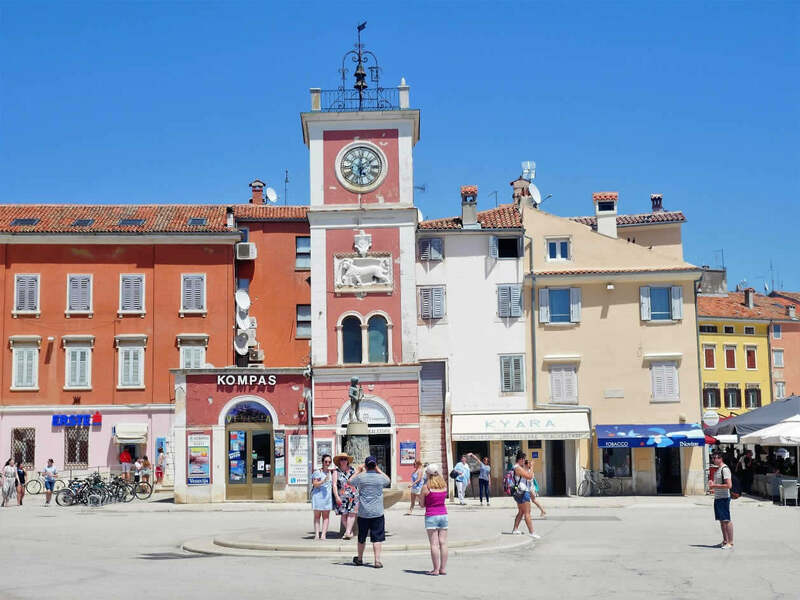 # – Batana House – Rovinj is a fishermen’s town and this museum is dedicated to a very specific type of boats used for fishing here, called batana. It’s one of the smallest museums I’ve ever been to (it consist of only two rooms) but also one of the greatest museums I’ve ever seen. Definitely a must if you want to get the whole story of this picturesque town! 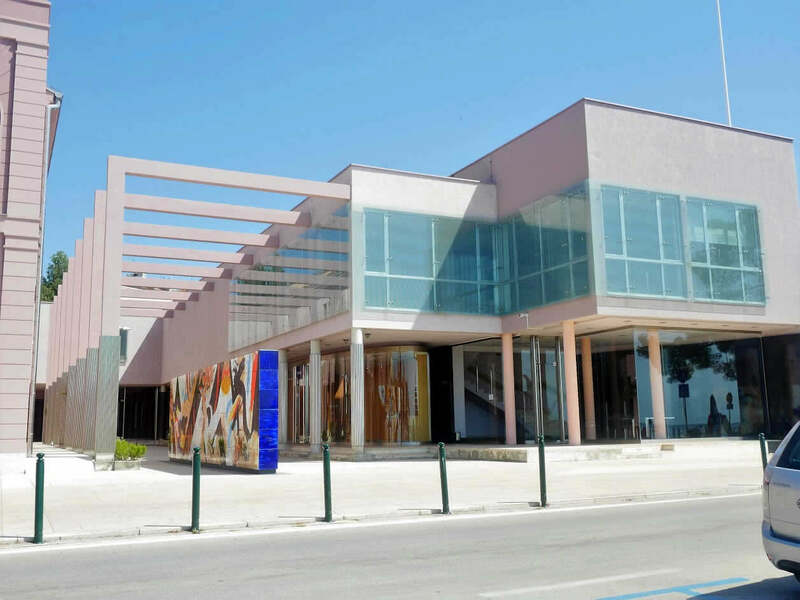 # – Civic Museum Rovinj – Beside showcasing a history of Rovinj and its surroundings, every summer the museum organizes a temporary exhibitions of some of the most popular modern or contemporary artists. They had Salvador Dali exhibition a few years ago and are having Joan Miro on display in the moment. 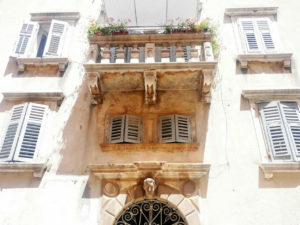 # – Adris Gallery – Also a great place to enjoy some of Croatian classics of modern art. With a free entrance and a location right next to the sea shore, it could be a perfect stop during your evening strolls. 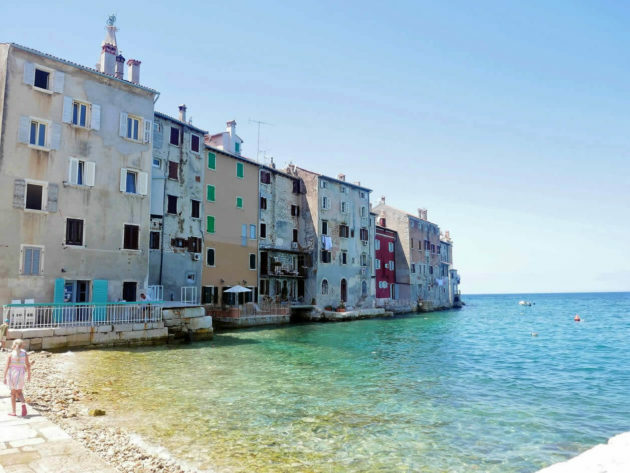 Being located at the Adriatic coast, my favourite activity in Rovinj is still swimming. My favourite beaches are along the forested park ‘Zlatni rt’. Beaches are like in the most of Croatia rocky, but I love them the most because they make sea looks crystal clear. They are the most beautiful in the morning when there are not many people around and the sea is still and almost transparent. The other thing which makes it one of my favourite beaches is a view on the old town. It is definitely a swimming with a view! Great Mediterranean food together with some nice Istrian wines are putting the final touch to Rovinj being such a great town. My favourite restaurant in Rovinj is ‘Veli Jože‘, but ‘Stella Maris‘ just next to it and ‘La Puntulina‘ are also a great choices! My only advice for the food when in Croatia is to eat local! Istrian food is amazing and it’s a great combination of a Mediterranean cuisine with a lot of sea products, fresh vegetables and olive oil and a food from more of a rural parts of the peninsula, with a lot of pasta and a stew like meals. It’s a wine region as well, so Malvazia (white wine) and Teran (red wine) should be on your list of things to try. I love local wine bar San Tommaso and am always taking a few bottles of their wine home with me. 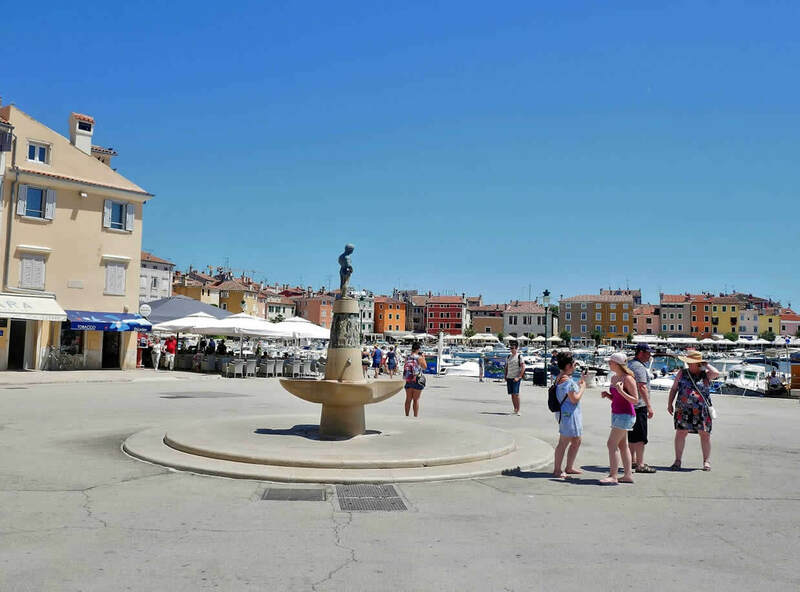 You can try some of their wines in a wine bar that has a terrace with one of the best sunset views in Rovinj, or you can buy some of their wines in a small shop they have in Rovinj, as well. 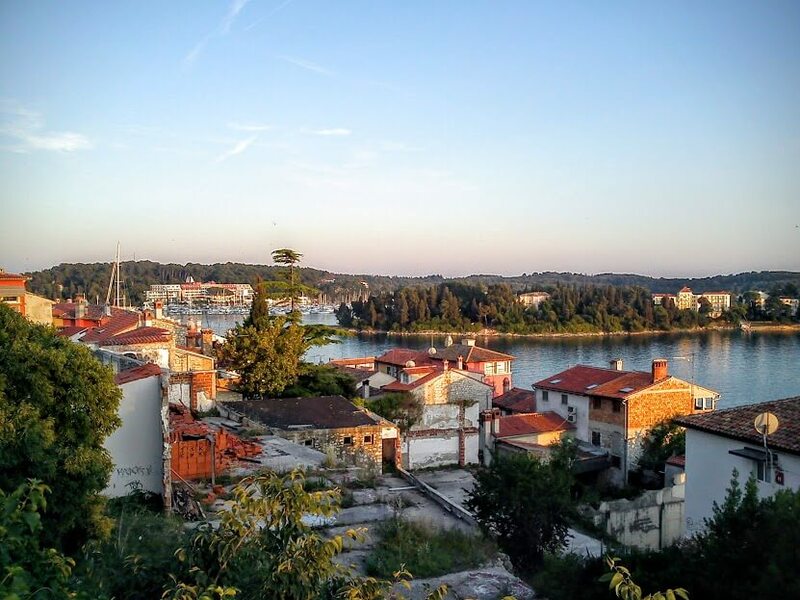 After the whole day of swimming, sunbathing, enjoying in Istrian cuisine, it’s the best to buy same ice cream or sit with a glass of wine somewhere with a nice view on a town and enjoy the moment. Enjoy the life! Have you been in Rovinj or some other Istrian towns? What were your favourite places? Looks wonderful! Do you think it’s a good place for a holiday with a 5-year-old girl or is it better for just the two of us?